Under the presidency of His Holiness Karekin II, Supreme Patriarch and Catholicos of All Armenians, a Prayer of Thanks Pomegranate-blessing service will be offered for the New Year. The service will be offered at midnight on the Eve of the New Year in the Mother See of Holy Etchmiadzin and all the churches of the Armenian Church. The government of the Republic of Nagorno-Karabakh has donated pomegranates to the Mother Cathedral for the Blessing of the Pomegranate. 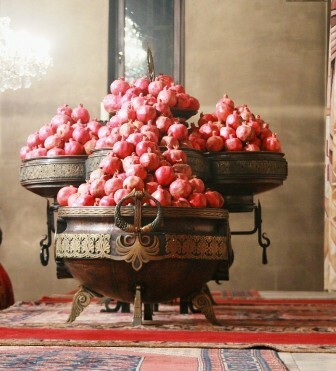 In the Armenian tradition, the pomegranate is a national symbol representing life, abundance and prosperity. In Christian symoblism, the pomegranate represents the blood shed by Jesus Christ, also symbolizing the Lord’s Glorious Resurrection and the diversity of God’s graces. And in interpretations by priests of the Armenian Church, the pomegranate also depicts that like the pomegranate seeds, the Church members are numerous and various, but are covered with a solid outer layer, being united into one Church. For this reason, the pomegranate is widely used in the ornamtentation of the church architecture, arts, and miniatures. The faithful are encouraged to participate in the Prayer of Thanks and the Pomegranate-blessing. This entry was posted in News and tagged Armenian Church, Lord Glorious Resurrection, Mother Cathedral, New Year, Supreme Patriarch by Orthodoxy Cognate PAGE. Bookmark the permalink.